Happy New Year to all! We spent the holidays here on beautiful St. Barth and loved seeing friends and clients at the beaches, shops and our cocktail party. And listening to Jimmy Buffett! We hope your holidays were truly special, and if your schedule didn’t permit a holiday getaway, we are sure you are ready for some palm trees and sunshine. 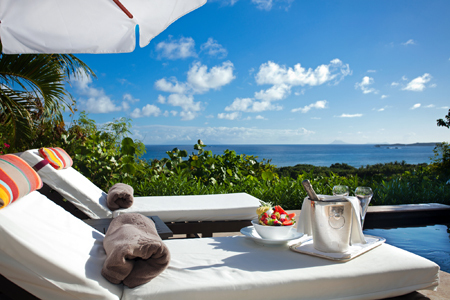 Valentine’s Day is right around the corner, and there is no place more romantic than St. Barth! Contact our villa specialists for their recommendation for a villa and a restaurant to celebrate. February and March school vacation weeks are the perfect time to gather your gang; make this the year you do a multi-generational villa vacation. We have some perfect-for-families’ properties with gorgeous swimming pools, decks designed for BBQs and home cinemas for DVD viewing. And for nautical buffs, don’t forget our exciting St. Barth Bucket is just around the corner, March 28-31. The St. Barth Dental Association had another successful on-island meeting (Jan 14-18). For us it is a family affair; my husband Steve and my son Mark are both dentists. They gave this year’s program high marks and report that everyone is already looking forward to next year’s conference. I hope to see you on the island and at our Tuesday evening cocktail party – back by popular demand at Bonito restaurant. Lucky you! You’ve just checked into one of the oh-so-secluded one bedroom villa suites at the gorgeous 5 star Hotel Le Toiny. These free-standing romantic little cottages offer a chic and comfortable separate living area, a compact kitchenette and a luxurious en suite bedroom graced with an elegant 4-poster bed. Just outside your door you’ll find a lovely terrace with your own private pool and breathtaking ocean views. Bonjour! Your terrace is the perfect place to start your day with a breakfast of fresh fruit and French pastries that will provide sustenance for you to explore the Pointe of Toiny via a two-mile walking path. Your sound track will be the Caribbean surf. If you finish up early, you may have time for a yoga lesson on the beach and even a swim in your private pool. Au naturel. Brunch time! The hotel’s restaurant Le Gaïac is famous for its Sunday Brunch so block off two hours and enjoy the food – and the view. It’s an experience. The buffet is beautiful and bountiful. Eggs are cooked to order and a chef mans the grill. May we suggest a bottle of Rosé? (2010) Esprit de Sainte-Marguerite or Château Sainte-Marguerite. Congrats to SBP’s Ted Deltour on the launch of his new website. Take a peek at Tresors De St Barth and see Ted’s gorgeous handmade creations – bracelets, pendants, earrings and more. Tahitian pearls (the oldest jewels known to man) are featured prominently and artfully strung on the finest Australian leather, often with shells, ancient coins and other gems. Pieces may be ordered online. Villa Parsifal – Privately situated out in Pointe Milou, Villa Parsifal is perfect for honeymooners. In addition to gorgeous views, Parsifal boasts fiery Caribbean sunsets. The 5 star Hotel Christopher with its restaurants and fabulous spa is just a short stroll away. Villa La Sirène – Beach-y casual, this delightful two-bedroom villa offers guests a St. Barth vacation experience on beautiful – and popular – Flamands Beach. The perfect villa for beach buffs, guests also enjoy walking to the oceanfront Hotel St. Barth Isle de France and the Taiwana for cocktails and to dine. Bookings are peaking for the St. Barth Bucket (March 28-31)! The great-for-viewing villas Clair de Lune, Belle Bague and Noé are still available, but hurry! Is there a dentist in the house? The St. Barth Dental Association has just announced its 2014 conference dates – January 20-24. Mark your calendars and contact us for more information on attending. The lower seasonal rate will be $395 USD per seat plus tax for travel on any day. This perennially popular villa, perched on one of St. Barth’s highest points, offers panoramic views in multiple directions from every vantage. The main house is on the pool level and includes the kitchen and living and dining areas. Each of the 3 king bedrooms, with bath en suite, is housed in a separate pavilion. A rear terrace, overlooking Grand Fond, is perfect for dining alfresco, and an additional rear terrace overlooking Grand Fond is perfect for dining alfresco while an additional private deck features a Jacuzzi. The ultimate vacation home with a great rental history! We truly had the best stay at the Hotel Christopher. The hotel was lovely and the staff, service, etc., impeccable. I would recommend the Christopher to anyone looking to vacation in St. Barth. Our stay was fantastic; we really enjoyed it. Roche Fleurie and we already miss St. Barths! Thank you for all of your help and look forward to next year.